"Anguo clergy attending the annual retreat"
Group photo of Anguo clergy attending the annual retreat. “My pastor is the one with a beard.” Front row: Bp. Souen (Sun Dezhen孫德楨) center and Fr. Vincent Lebbe to his right; second row between Sun and Lebbe: Fr. 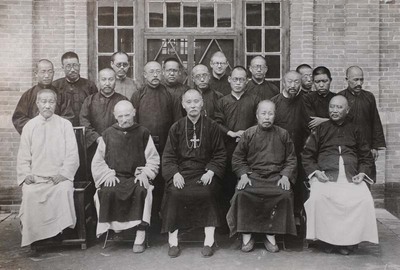 John-Baptist Wang (Wang Zengyi 王增義) who succeeded Sun as vicar apostolic of Anguo; second row with a beard: Fr. Jean-Baptiste Fan樊 pastor of Anguo; last row center: Fr. Raymond de Jaegher . Anguo clergy attending the annual retreat. October 1932. Société des Auxiliaires des Missions (SAM) China Photograph Collection, Whitworth University Library, Spokane.